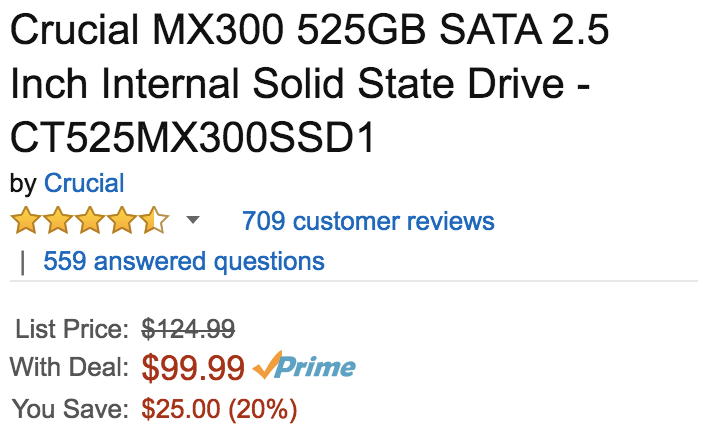 Amazon offers the Crucial MX300 525GB 2.5-inch Internal Solid-State Drive for $99.99 shipped. That’s good for $25 off the regular price and an Amazon all-time low. This popular solid-state drive is rated 4.7/5 stars by over 700 Amazon customers. ICYMI: Samsung 850 EVO SSDs: 500GB $115 (Reg. $160), 1TB $220 (Reg. $330), more and don’t forget our huge list of SanDisk discounts over at Amazon, too.